The Deputy Vice-Chancellor, Academic and Chairman, Students’ Industrial Work Experience Scheme (SIWES) Committee, Professor Adekojo Waheed, had charged students embarking on the SIWES Industrial Training (IT) Programme, to take the programme very seriously. Professor Waheed, who gave this charge during the SIWES Orientation Programme organised for Non- Agricultural Students (Batch B) in the University, noted that SIWES was an important scheme that was structured to provide students with ample opportunities to be equipped with the requisite theoretical skills in real work situations, thereby bridging the gap between theory and practice. He admonished the students to be good ambassadors of the University, by being responsible wherever they find themselves, adding that by their good conducts, they could easily gain employment in reputable organisations after completing their degree programmes in FUNAAB. Addressing the students on the topic; “Keeping Fit and Maintaining Optimum Health During the SIWES Year”, the Director, Health Services of FUNAAB, Dr. Olusola Talabi, advised these safety measures should be put in place by the respective organisations, where students carry out their Industrial Training, as they must not be prone to accidents. He also called on the students to cultivate healthy eating habits by eating balanced diets, drinking plenty of water and exercising regularly. Other measures necessary to stay healthy include avoiding alcohol intake, smoking, taking only prescribed medications, maintenance of good hygiene and healthy body weight. 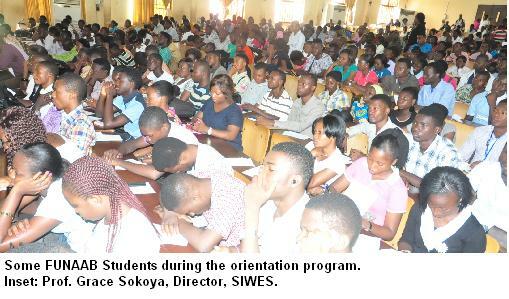 Earlier, the Director of SIWES, Professor Grace Sokoya, said SIWES was part of the approved Benchmark Minimum Academic Standards (BMAS), designed for undergraduate degree programmes in Nigerian Universities. “It is a planned and structured scheme with specific career objectives geared towards developing participants’ occupational competences, to prepare them for post-graduation real work situations”. 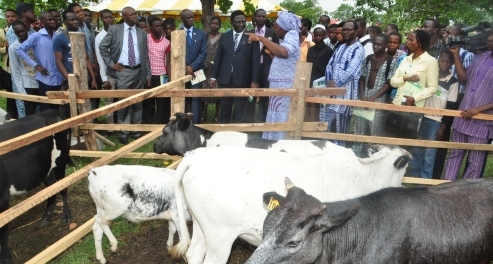 Speaking on the objectives of the scheme, Prof. Sokoya said it would expose students to good methods and techniques of handling equipment and machinery that may not be available in their institutions, by making the transition from school-to-the-world-of-work easier and networking for job placement. The Area Manager, Industrial Training Fund (ITF), Abeokuta Area Office, Mrs. Adesola Taiwo, enlightened the students on what was expected of them during the IT and how to complete their log-books and corresponding forms that would enhance their successful completion of the scheme.